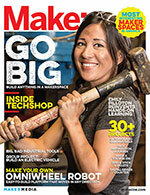 In mid-March, I started working at San Francisco startup Other Machine Co., after more than a year and a half working as a product development engineer for the Maker Shed. During that period, I learned a lot about e-commerce, how to bring a variety of products to life through efficient part sourcing, and how to market them effectively once they’d launched. But as my knowledge of product development and management grew, I strove to learn more about the manufacturing processes and engineering required to bring kit components to life. 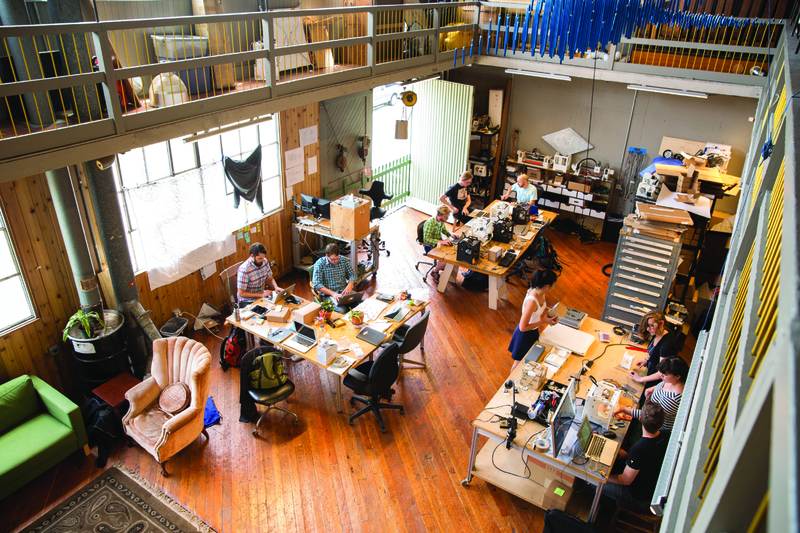 I knew that working for a startup like OMC would help me get the knowledge I sought, and I was excited to work in a space that reminded me of the machine shop I frequented in college — full of people who are smarter than me, making things that inspire me. So I moved to the Bay and began work in a field I was eager to learn more about: manufacturing desktop computer numerically controlled (CNC) machines. 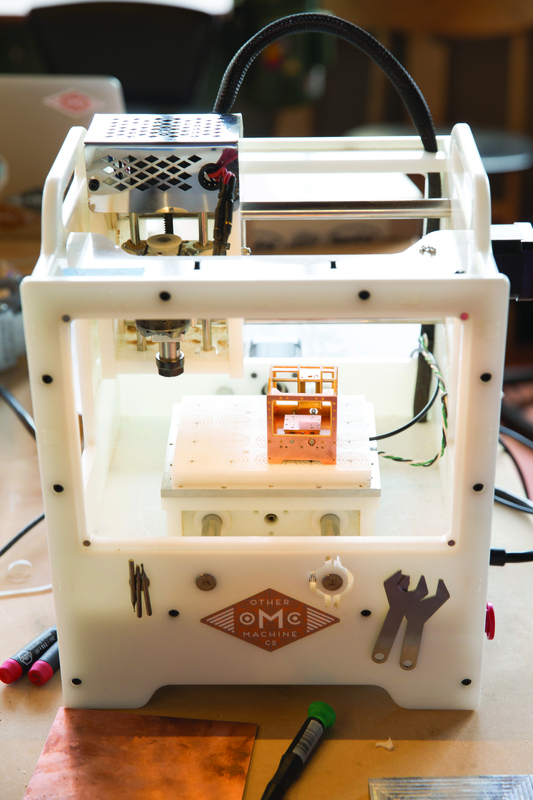 Our main product, the Othermill, is a desktop-friendly, 16-pound CNC mill designed for precision work. Unlike 3D printers, which deposit plastic material from a nozzle in an additive process, mills do the opposite, removing material using a high-speed cutting tool. This subtractive process allows the mill to build parts from a much wider range of materials. It can cut anything softer than the cutting tool itself, and often in much less time than a 3D printer could print the object. When I started, I figured I had a passable grasp on what it meant to bring a great product to life, but I was wrong. In the past, I’d often look at technical specifications on product pages without thinking about the challenges of actually achieving them on a repeatable basis. I typically thought, “Oh, resolution down to 1/1000 of an inch. I could make some really dimensionally accurate parts with that thing.” Have you ever thought about what it takes to get there, every single time? Neither had I. 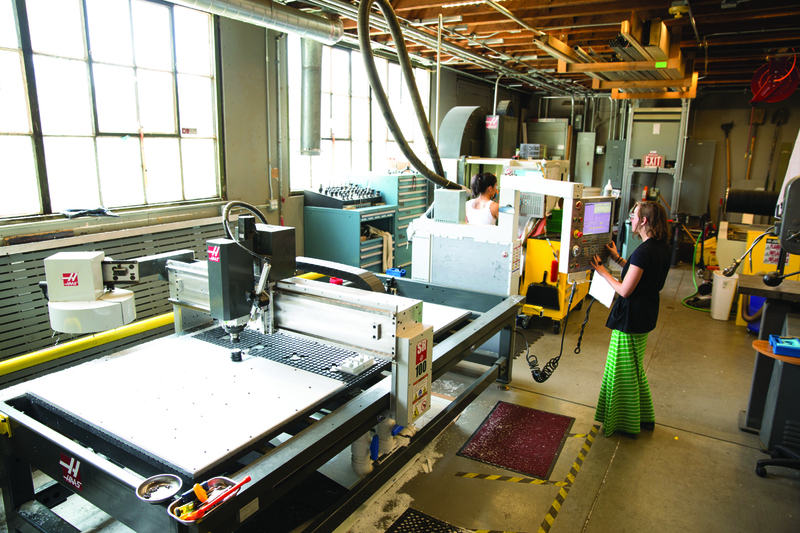 The frame of the Othermill is the most critical component, and we produce each one in-house on a Haas CNC router. Since the overall look, feel, and ease of assembly of the machine is dependent on the HDPE frame, we handle the stock HDPE sheets with the utmost care. Ideally, each frame ends up exactly the same post-machining. Unfortunately, some things are out of our control. I learned early on to not trust the thickness tolerances provided by plastic suppliers — we’ve seen sheets vary by up to 1/32 of an inch, which is huge when many of our features are depth-dependent. Nevertheless, we protect the stack of sheets from dust and other airborne particles in the shop with a plastic cover, and each sheet is wiped down before mounting on the router bed. We even installed antiglare covers on the windows of the shop, in case the temperature change between their cool storage spot and the heat of the morning sun on the router bed might cause thermal deformation. No specific occurrences point to the sun as a possible culprit of strange dimensional changes, but you can’t leave anything to chance. I quickly learned that serious attention to detail is required to repeatedly and reliably hit the resolutions we’re after. I was immediately thrown into the world of quality control (QC) and the tools used to complete it effectively. We use pin gauges — cylinders of steel ground down to extremely precise diameters — to check the size of the critical features in each frame as it comes off the router bed, and we use digital micrometers to check the thickness of the features that hold the machine together. Deviations of 1/1000 of an inch in diameter, differences you’d never notice without QC tools like the gauges, can lead us to scrapping the part, which is a serious cost and time drain, especially for a startup like us. The second most critical component of the mill is the spindle assembly, which contains the precision bearings, shaft, and the motor that rapidly rotates the cutting tool. The bearings inside the spindle assembly allow the shaft to spin freely and, hopefully, perfectly perpendicular to the bed. Any play in the assembly causes spindle “runout” (a slight wiggle), leading to less accurate cuts. We work to avoid this in every spindle assembly we produce by not only constantly refining the manufacturing process, but also by testing different ways to put them together. Since any play in the assembly isn’t warranted, we’ve tested various adhesives, set times, and loads for pressing everything together. Once we’re confident that the spindle is in tip-top shape, we have each machine “face,” or cut a small layer of material off its own aluminum bed, to ensure that the bed and the spindle are perfectly perpendicular to each other. The most painful part of my job is seeing an assembled mill, which we put so much time and effort into producing, fail the QC process due to a bad part. And thus, controlling the quality of the components is absolutely key. Once I was able to get in the shop and help out with production, the significance of designing with manufacturing in mind became clear, especially when dealing with large quantities. Relocating the position of certain components on the router bed during machining or changing the design of a part in CAD can shave precious seconds off production time. And when shipping machines is a priority, every second counts. Beginning with the right components saves tons of time as well. Finding parts that are easy to install during assembly and work properly over a long period is critical to preventing customer service issues down the line. One of my early tasks was to complete HALT, or “highly accelerated life testing,” on a potential limit switch for the next version of the machine. The limit switch is what notifies the software when each axis has reached its limit. To do so, I modified a current motor assembly to accept the new limit switch and wrote a few simple lines of code to continuously and repeatedly ram the spindle assembly into the switch, for hundreds of cycles, to ensure it would still operate after being put through harsh circumstances. We’d eventually like to run an Othermill continuously until it stops working, hopefully after days, while keeping an eye on it with a Raspberry Pi, sensors, and a webcam. It became clear that creating jigs and adding automation wherever possible is an incredible way to save time as well. Instead of fastening certain components down with bolts during machining, for example, we’re working towards a future of press-fit pins, so the pieces can just be popped into place in seconds. No matter how much you plan ahead, things are going to go wrong. We recently experienced a rare lightning storm in San Francisco, which sent a power surge through the building and knocked the life out of our most valuable tool: the frame-producing Haas CNC router. It was down for a gut-wrenching week and a half, during which we had to do whatever it took to continue prototyping parts for the next version of the Othermill. So, I cut a test part for the Othermill on the Othermill itself. Finding creative solutions to inevitable problems like this is imperative if you want to keep pushing forward. Our team encounters problems every day that we solve by building or modifying something to fix it, and that sort of spontaneous making out of necessity is what I’ve enjoyed most so far. My preconceptions about manufacturing a high-resolution product have shifted as I’ve been exposed to the challenges of getting it done, and my appreciation for the quality of the mass-produced hardware around me has skyrocketed as a result.